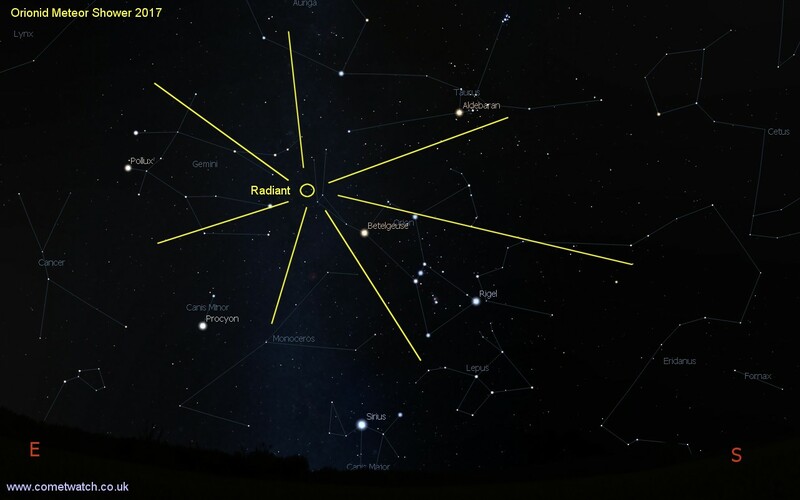 One of the best meteor showers of the annual calendar occurs this weekend. The Orionids often produce very bright and fast meteors. The name is given because of the direction from which the meteors radiate from, namely the constellation of Orion. The meteor shower is expected to produce around 20 meteors per hour at its peak however this number can fluctuate. The particles that produce these ‘shooting stars’ originate from Halley’s Comet. Categorised as a short period comet, the famous piece of ice and dust has an orbital period of 75-76 years. The comet has left a steady stream of dust and particles around its orbit path in the solar system. October 20-21 is when the Earth passes through this orbit head on each year producing the meteor shower. So effectively when observing the Orionid meteor shower, you are watching little pieces of Halley’s Comet burn up in the sky. As the meteors radiate from the constellation of Orion, the best time to view them is when the radiant is at its highest point in the sky. 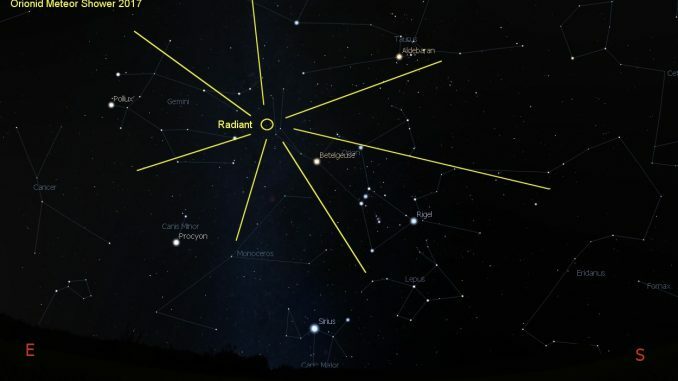 The radiant is located near Orion’s sword, slightly north of his left shoulder. The bright orange star Betelgeuse is just below and to the right of this area of the sky. The constellation of Orion doesn’t rise fully until after midnight. The best time to view the Orionid meteor shower is in the early hours of Sunday 22 October (night of Saturday 21st) ideally after 1:30 a.m. With the Moon out of the way this year, some decent hourly rates of meteors should be seen from a dark sky site. Even from towns and cities there are still chances of seeing a few per hour as many of these meteors can be bright. Even though the shooting stars radiate from the constellation of Orion, it’s best not to look straight at Orion as the meteors only begin here and often streak a long way across the sky. Their brightest point may by high overhead or even over in the Northern or Western sky. The best advice is to find a way to comfortably lie on your back, look up and keep warm. Staying still for long periods of time in the early hours of an October night will rapidly get you shivering without appropriate clothing (and thermos flask). Layer up and make sure you wear a hat. 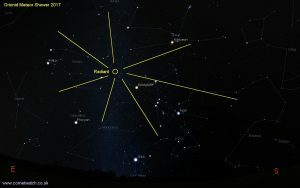 The illustration above shows where the radiant is in the sky for the Orionids but as said before, this is not the ideal place in the sky to stare at if you want to see plenty of the meteors. It is the 14th of November, and I am in Glengarriff, Southwest Cork, Ireland. Outside wTching the stars, I saw 6 meteors distincly in an hour(what shower) and something overhead north,that seemed to pulse light irregularily. It seemed to have a stretched trianglar form, reminisent of Hale-Bopp, but, without the prominent head. What was it? It did not progess across the sky. Thanks.